Get a Free Sump Pump Estimate! Contact us today for your sump pump system installation! 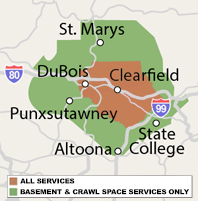 We serve Altoona, State College, Bellefonte, Du Bois, Saint Marys and many surrounding areas. Schedule a Free Estimate for a Sump Pump!